The distance learning department (e-ENSG) produces and manages some educational content for distance learning use. 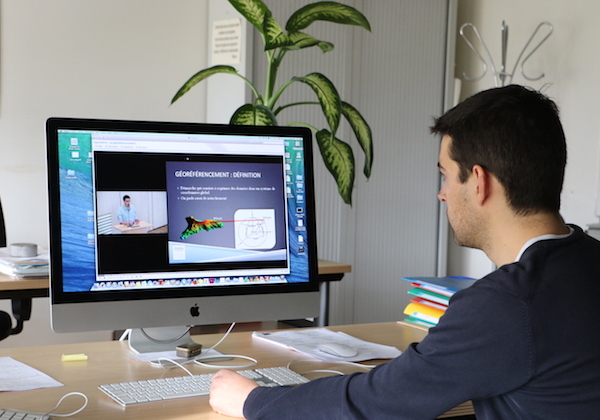 It provides its partners, students and the School with a wide range of digital teaching resources and unique tutoring methods in higher education in GI science. Attending an ENSG online course generally does not require any special prerequisites except for a certain habit of handling the Internet and web browsers as well as e-mail. In some cases, the student needs to be able to install specific software on his computer. The duration of an online training is expressed in "face-to-face equivalent time" which would correspond to the "normal" amount of time if the course was given physically at the ENSG. We leave a much longer period of training, which allows everyone to train a little every day at his own pace thus avoiding becoming drowned by the amount of information received. It will also allow people with a day-to-day job to follow this training outside of offices hours. Consult us for any adaptation and custom quote. Launch: On-demand remote training is launched for a minimum of 6 trainees. Registration can be done until the day before the start of the training. The courses below are entirely and exclusively taught from a distance and in french! They are part of a set of more than fifty short courses offered by the ENSG and described in the general catalog (fr). In this distance learning service, learners are accompanied and evaluated (tutored) by a thematic specialist in training and tutoring. The educational path is controlled and certified by the ENSG. All courses are currently delivered in French. Wherever you are in the world you can train in geomatics by taking advantage of our services in French.